We are a company dedicated to full repair services in the Turbine Industry with over 100 years of combined experience consistently working with the highest ethics and professionalism in providing the highest quality. We provide the shortest back online of minor and/or major repairs, while never compromising quality. 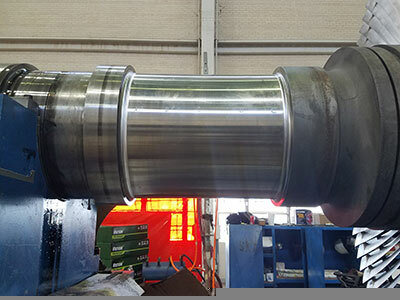 By providing our expertise in all aspects of turbine repairs and supplying repair parts to the Thermoelectric Power Plants, we are able to increase power generation performance and reduce costs by hundreds of thousands of dollars, resulting in demonstrated profit gains for our customers, making our customers the number one priority in the turbo machinery industry. Sky Power Turbine Ind, Inc. is committed to the supply of products and services which meet the requirements and expectations of our customers in every way. A major element of this objective is the implementation, maintenance and improvement of a Quality System which conforms to the requirements of ISO 9001: 2008. We all share a common objective and responsibility in seeking the highest standard of professionalism in our work and a commitment to continually improving quality at all levels of the organization. One of our mission is to offer you the best possible services to make your operations safer, more efficient and more reliable. We are confident you will find Sky Power Turbine to be different from other industry players; offering a truly unique combination of OEM capability coupled with the flexibility, transparency and responsiveness of an independent. One of our vision is to be focused on every aspect of the customer experience with Sky Power Turbine. We ensure we have well documented procedures for all processes which provide consistency and repeatability. We innovate and train our teams to meet the ever changing demands that our internal and external customers face and review our customer feedback for improvement opportunities. Your safety is the constant concern of this organization. Every precaution has been taken to provide a safe workplace. Our management team makes regular inspections and holds regular safety meetings. The safety manager also meets with management to plan and implement further improvements in our safety program. Common sense and personal interest in safety are still the greatest guarantees of your safety at work, on the road, and at home. We take your safety seriously and any willful or habitual violation of safety rules will be considered cause for dismissal. Sky Power Turbine Ind, Inc. is sincerely concerned for the health and well being of each employee. Our Quality Management system is the foundation from which we strive to consistently meet the product and service expectations of our valued customers. We embrace the principles of ISO 9001: 2008 by ensuring we understand and always deliver products and services that meet these needs and expectations. Our company is prepared to respond in an effective and timely manner to complete repairs (on Time), working around the clock 24 hours 7 days a week whenever and wherever required. L P. Gorvernor end journal as found. L P Journal Governor Before Machining. Grinding Journal to Straightness and smooth finish. We have a broad working experience with a variety of major global industries. 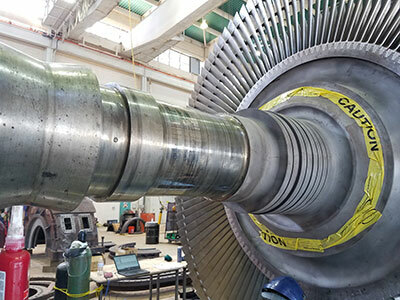 Some capabilities we share are: Steam or Gas Turbine Bucket and Blade Replacement. Cast Iron Diaphragm and Casting Weld Repairs.